Mybroga starts its 52th season the next week, with two divisions. The A racing at wednesdays and the B at tuesdays (divisions are rather "autoperceived"). Div A will race with original 1967 F1 cars, while Div B will race the F2 mod. We race with Int long mode, with 60 minutes of qualy and races of approximately 45 minutes starting from 2130 of Argentina (GMT -3). The server is configured to be "ping-friendly" to drivers from NorthAmerica and Western Europe too. 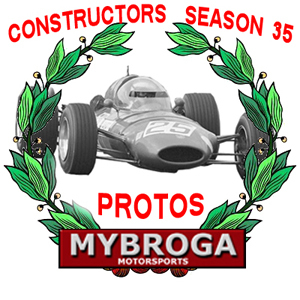 We are also at facebook as "Mybroga (grand prix legends)"
Cheers and Long Live GPL!! Edited by mcmirande, 06 February 2019 - 07:57 PM.